"A very simple stir-fry dish. 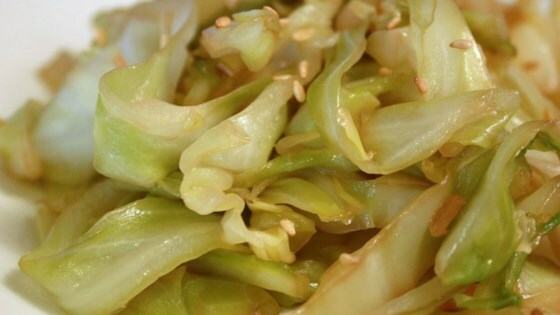 The reason for using only soya sauce for stir-frying cabbage is that it brings out the natural sweetness in the cabbage itself." Heat the vegetable oil in a wok or large skillet over medium heat. Stir in the garlic, and cook for a few seconds until it begins to brown. Stir in the cabbage until it is coated in oil; cover the wok, and cook for 1 minute. Pour in the soy sauce, and cook and stir for another minute. Increase the heat to high, and stir in the Chinese cooking wine. Cook and stir until the cabbage is tender, about 2 minutes more. I prefer to use a gas stove for this recipe. Okay, I was a little wierded out by the thought of eating straight cabbage, but this dish is amazing! I also tried it with apple cider vinegar in place of the wine, and it's great either way. Family didn't like this recipe at all. May be because I used savory cabbage. Didn't turn out very tasty. A friend of mine showed me his version of this. He added sliced onions to the cabbage, salt and pepper. It was awesome! It is amazing how simple a dish it is and how good it is! I usually make this when I have left over coleslaw mix. It is quick and easy. I sometimes add a couple drops of sesame oil or some sesame seeds for variation. Amazing recipe for being so simply. I substituted red wine vinegar, and it turned out great!